Despite being home to the world's first giga-coaster, the Frontier Trail is the quietest part of the park, providing a peaceful retreat from the thrills provided throughout the park. Travel into the past, as you experience days gone by along this wooded path. The Frontier Trail has never really been known for its rides. In fact, until 1986, there were not any rides on The Trail. That's changing, however, as there are now three rides -- two water rides, and a magnificent coaster. Between the shaded trail and these rides, Frontier Trail is a great place to cool down on those hot summer days. When approaching The Point, there are many visible structures. One of the tallest is located here. 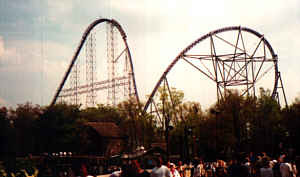 We now approach the awesome giant that sprouted up on the Frontier Trail for the 2000 season, Millennium Force. When I first heard that Cedar Point's 14th coaster was going to be placed on the peaceful Frontier Trail, I had mixed emotions. Naturally, I was delighted at the prospect of a new world-class coaster. However, I was also a bit distressed at what the structure would do to the park's quietest midway. Well, despite its incredible size and speed, Millennium Force isn't as noisy as one would expect (excluding the screams of the riders! ), hence this magnificent coaster fits rather well with the serene surroundings. Does this serenity mean that this coaster is tame? Not by a long shot! Millennium Force is an absolutely remarkable coaster. As the trains rush forward, you can hear the air tearing apart as the entire atmosphere bends in submission to this spectacular coaster. The ride is an adrenaline rush from beginning to end! Even the lift hill is fast! Want to talk about World Records? Here are some interesting facts surrounding Millennium Force. When it was built, It was the world's tallest roller coaster at 310 feet. It was also the world's fastest roller coaster, reaching speeds of 92 miles per hour (now claimed to be 93 MPH). It had the world's longest roller coaster drop at 300 feet. It gave Cedar Point the most roller coasters in the world with 14 (now up to 17), and the most rides in the world with 68 (now up to 75). 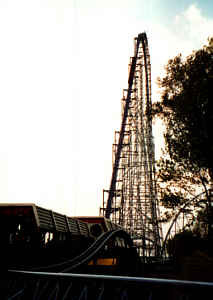 Millennium Force was the first coaster to break the 300 foot barrier. 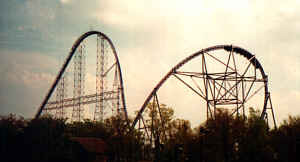 The coaster gave Cedar Point the most steel coasters in the world with 12 (now at 15). Cedar Point also has more roller coaster track than anywhere else in the world, with 44,013 feet (now up to 51,803 feet). Millennium Force is the first coaster in the world to use the fast and quiet elevator lift cable system. 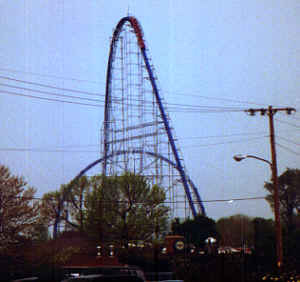 Millennium Force has the world's steepest non-inversion banked turn on a roller coaster at 122 degrees. Finally, Millennium Force made Cedar Point the first park in the world to have two coasters over 200 feet tall (since boosted to four, including two over 300 feet). Wow! This coaster is awesome at any time of the day, but it really provides an incredible experience at night. Going down the first drop, it looks like the train is racing into a black hole! Additionally, the structure has some beautiful lighting effects, making the first hill look like something from a fantasy world. Oh, due to the wild intensity of this ride, Cedar Point will not allow ANY loose articles. That designation includes purses, cameras, and presidential interns. (Sorry, couldn't avoid that bad joke!) There are lockers near the ride entrance -- be sure to lock your loose stuff in those! Also, since Millennium Force is an awesome coaster, you should be prepared for a long wait. 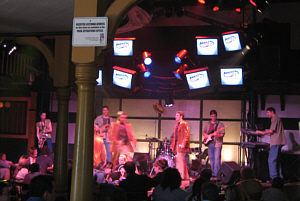 During a preview weekend in early May, 2000, waits were exceeding 3 hours. Yeouch! 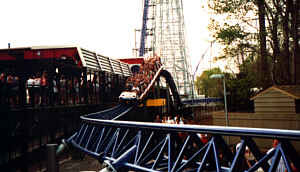 If any coaster in the world is worth such a wait, however, it is Millennium Force. Later that same summer, waits topped an incredible 6 hours -- even I won't wait that long for a coaster! The last time Cedar Point had 6 hour waits was when Gemini was introduced, way back in 1978. We have to trek the length of Millennium Force, reaching the end of The Trail before we find any more rides. As we near Frontiertown, we see Thunder Canyon on the left. 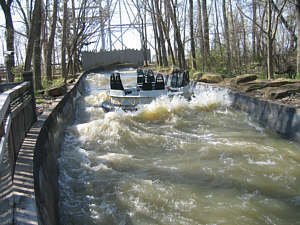 Thunder Canyon is a river rafting ride, with more than one million gallons of water flowing through it. 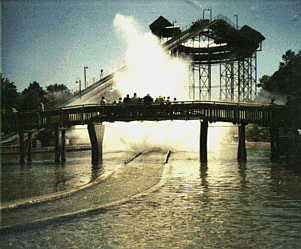 When the ride was installed in 1986, the park employees nicknamed it "Thunder Car Wash -- the definition of overkill!" You will get wet and possibly soaked on Thunder Canyon as you encounter the likelihood of being drenched by multiple waterfalls. Informal statistics show that all but two seats, on the average, will get dumped on by at least one waterfall. On hot days, that water feels great! Because Cedar Point wants you to enjoy your entire day, you are allowed to take off your shoes for Thunder Canyon. Lockers are available for leaving belongings that you want to keep dry. Just a word of warning, however. The platform is NOT the place to leave these items. The platform is a large turntable, with lots of action. If you leave your belongings here, they may accidentally find the water, anyhow. As wonderful as it feels on a hot day, you probably should avoid Thunder Canyon on the cooler days, unless you have a change of clothes readily available. During Thunder Canyon's first season, I had a friend who test rode the ride in early May, when the temperatures were in the low 40's. During test riding, he had to go through the ride several times. When he finally got off, the first thing he heard was a recording indicating the "Air conditioned comfort of Lusty Lil's Showtime Palace." Ah yes, the human popsicle is born! Without a doubt, the most descriptive explanation I've ever heard of Thunder Canyon came from two teenagers that I overheard talking one day. 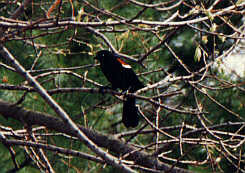 The one teen said to the other, "See, I told you. It's that thing where you sit in the thing." Now, who could possibly argue with a description like that? Cedar Point did make a slight error (in my opinion) when creating Thunder Canyon. The ride uses a pump system that brings the water in straight from Lake Erie. Well, Lake Erie is a rather clean lake, but trapping lake water in a confined space tends to lead to the build-up of some rather unpleasant odors. To reduce this problem, Cedar Point empties the ride every night, and scrubs it down regularly. If you arrive early in the morning, you can stand on the observation platform and watch the wall of water flow through the ride as it is pumped in from the lake. It looks like something from a flood disaster movie! Not wet enough after getting off Thunder Canyon? No problem! Right across the midway is Snake River Falls. 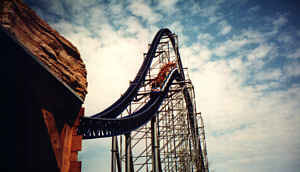 In 1993, this ride was the tallest and steepest of its kind in the world. The concept of the ride is rather simple. You go up, then around, then down, where water splashes everywhere. I've been on similar rides in other parks where the drop was about half the height of Snake River Falls, and I found them rather dull. 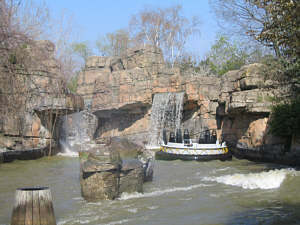 However, the extra height of Snake River Falls makes this ride a real winner! When you hit the bottom, you see water shooting upwards in every direction. You will even have enough time to think, "Gee, I didn't get very wet." Well, what goes up generally comes back down! In this case, quite a bit of that water falls right back on the boat, drenching everyone inside. You may notice some people standing on that bridge. They apparently were still not wet enough, so they are waiting for that wall of water to hit them. In Snake River Falls, Cedar Point showed that they do learn from their mistakes. 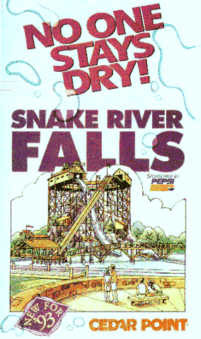 While Thunder Canyon uses Lake Erie water, Snake River Falls uses fresh water. So, if you are smelling a bit fishy after Thunder Canyon, go ride Snake River Falls to smell fresh once again! Snake River Falls actually provided a bit of a dilemma when creating this particular page. 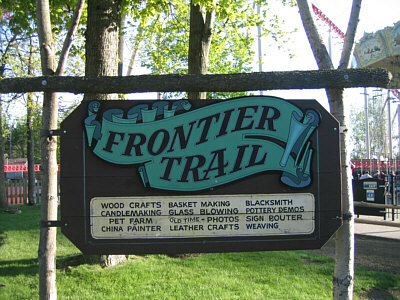 The entrance to the ride is in Frontiertown, with the exit on the Frontier Trail. However, I felt that the ride had more of an impact on the Frontier Trail, so I included it here. Besides, Frontiertown has many other rides that it can claim. Children and adults typically enjoy the Early Petting Farm, halfway down the Frontier Trail. 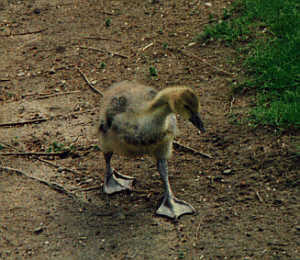 In the spring, there are often young ducks and geese in this area, as seen in these pictures. 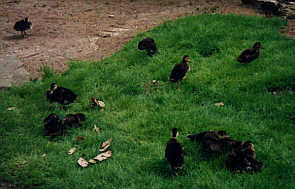 The various animals can be fed. The goats are the most fun to feed, using a baby bottle to give them milk. While you've got that bottle, those goats will consider you their best friend! 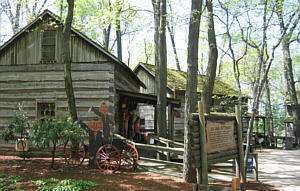 Frontier Trail offers several shows, plus arts and crafts exhibits. It wouldn't be all that hard to consider much of this midway to be a show about the 1800's. 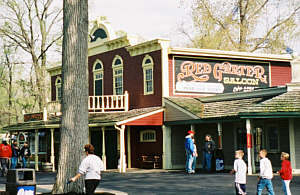 At the start of the journey down the Frontier Trail, we see The Red Garter Saloon. In addition to having food, soft drinks, and adult beverages, The Red Garter has a live show. Country Unleashed runs from May 10 through September 1 (except Tuesdays). Stomp your hands and clap your feet (or something like that) to the country music hits. Yeeeeeeeee-haw! The Red Garter fills up fast, so be sure to show up early to get the best seats. Who knows, you might even find yourself on stage! 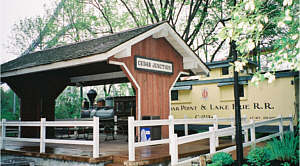 While not actually a show, the Cedar Junction is a showplace for an antique steam engine and caboose. Once in a while, a special show takes place at the Cedar Junction, but it generally is just a nice spot for taking a rest. During the HalloWeekends, Cedar Junction often becomes haunted. Those ghosts just can't keep away from the Cedar Point fun! After passing through Tenderfoot Pass, we come across E.J. 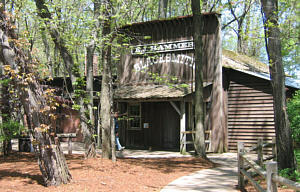 Hammer's Blacksmith Shop. 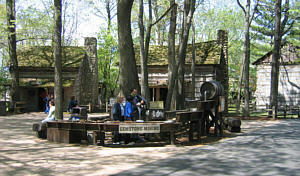 At times, a real blacksmith can be seen at this shop, demonstrating how he works with metal. The shop even sells some of the items made right at Cedar Point. 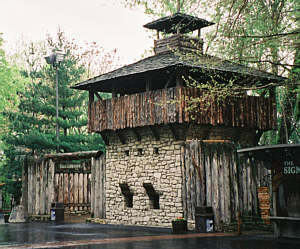 As we continue down the trail, we see Fort Sandusky, a replica of a fort that once stood in the Sandusky area. Be sure to stop inside and take a look around. Just try to avoid firing the cannons -- they make a terrible racket. A bit farther down, we come across the J.W. 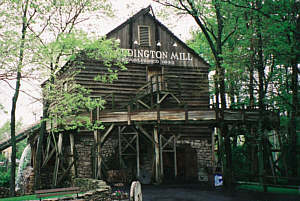 Addington Mill. Stop inside and check out the working mechanisms of the old water-driven mill. Not only is it scenic, it makes for a great place to rest and think. Near the end of the trail is a rather odd looking building, with many bottles sticking out of it. This building is where the Glass Blower is found. This show is a real treat on cooler days after riding the water rides, as the glass blowing furnace generates quite a bit of heat! This building narrowly escaped destruction in 1987. A tornado swept through this area, tearing out a large tree, which fell just a few feet from the glass shop. Thunder Canyon was closed for a few days, as the entrance path was torn out by the uprooted tree. I'll tell you more about that tornado in the Frontiertown Games section. 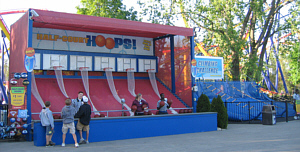 There are a couple of games near Millennium Force. One of them is a ladder climb, where you can look really silly trying to reach the end of the ladder! The other is a Half Court Hoops basketball toss. Farther along, we find one of my favorite spots in the park, the Toot Sweets Candy Factory. You can get delicious ice cream, wonderful cookies, and fresh fudge at this stop. Whoops, I hope that drool doesn't damage my keyboard! 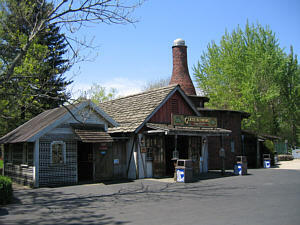 Grist Mill Refreshments is located near Snake River Falls. 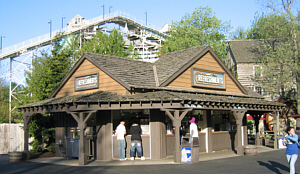 This food stand provides hot dogs and other standard amusement park food. On the Wildcat Midway, I promised some fun shopping on the Frontier Trail. Well, I meant it! 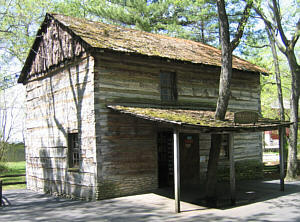 At the start of the Trail, you'll find an old-time photo building. Get dressed up in some western clothing, and get your picture taken. The results look like something out of the third Back To The Future movie! Just across the street from E.J. 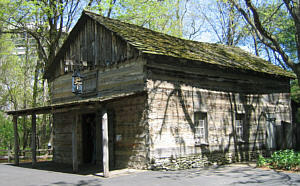 Hammer's Blacksmith shop, we find Frontier Heart and Home. This store has a variety of unique old style items. One of my favorite long-standing merchants is Bob's Boats. Why? I don't know, I just like 'em! 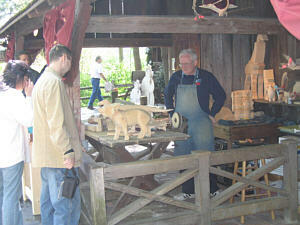 However, I also miss 'em -- Bob stopped coming around in 1999, although, as seen to the right, live woodcarving still takes place. About half way down the trail, we find a group of old log cabins. These cabins are originals, brought in piece-by-piece for an approximate cost of three million dollars. Within the cabins, there are quite a few interesting crafts for sale, unlike anything you'll find at most amusement parks. This area is where the shopping can really be fun, as you'll find many unique hand-crafted articles. In 2006, the cluster of cabins added a mining activity. Grab a bag of dirt, sift through it, and find out what treasures lie within! Since Cedar Point's parent company, Cedar Fair, purchased Knott's Berry Farm in California, a bit of the Knott's flavor has found its way to Sandusky. Stop in the Berry Market to purchase Knott's Berry products, including Walter Knott's famous boysenberry jam, and kits for making home versions of Mrs. Knott's fabulous fried chicken. 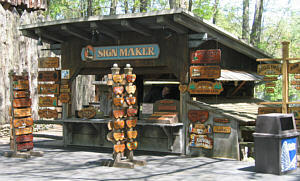 Would you like to do some of your own craft work while visiting Cedar Point? The Candle Shoppe allows you to make your own candles. 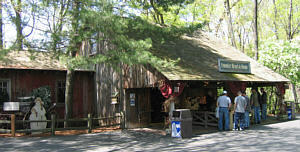 You can also see demonstrations of candle making, and you can buy candles that were made by Cedar Point's crafts people. You can also find a sketch artist along the Trail. You can get a serious portrait, or, if you prefer, a humorous caricature. Have you been looking for an original sign, proclaiming your name and/or address? Look no further! The Sign Shop can provide you with a sign, carved to your specifications. Remember that blacksmith and glass blower? Well, they are both located at shops where you can buy interesting iron and glass items, some of which were made right at the park. These are items you won't find anywhere else!